Christina Walls, left, and Diana Lennon embrace during a candlelight vigil July 24, 2015, to honor victims killed a day earlier in a movie theater in Lafayette, Louisiana. Emily Mann and her friend had come into the theater a bit late for the evening showing of "Trainwreck,'' so they quietly found seats near the top of the small theater. The 21-year-old didn't notice the man just a few seats down until 20 minutes into the movie when he got up and began firing into the crowd. "You hear one loud shot and you're sure that's not what it is because it would never be that. And then you hear another and another and another, and you realize that those aren't just lights and sounds,'' said Mann, speaking to The Associated Press about the brutal killing in a Lafayette movie theater Thursday evening. John Russel Houser has been identified as the gunman. 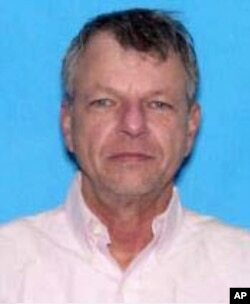 John Russell Houser, 59, stood up without a word and started shooting, leaving a horrific scene of blood, bullet holes, spent shell casings, and personal possessions like purses and wallets in a movie theater that was supposed to be a refuge from the stress of daily life. Amid the tragedy, a tale of heroism emerged: high school English teacher Ali Martin, suffering from a gunshot to the kneecap, made her way to a fire alarm and pulled it. Police say she saved lives, alerting some 300 people in the giant multiplex that something wasn't right. Police say Houser then tried to blend into the crowd heading outside as the alarm blared. But he turned back as police officers approached, reloading and firing into the crowd before killing himself with a single shot inside the theater, police said. Investigators recovered Houser's journals, were studying his online postings and trying to reconstruct his movements to identify a motive and provide what Louisiana State Police Colonel Michael Edmonson called "some closure'' for the victims' families. He had been in Louisiana only since early July, staying in a Motel 6 room littered with wigs and disguises. His only known connection to Lafayette was an uncle who died there three decades ago. Details quickly emerged about Houser's mental problems, prompting authorities in Louisiana and Alabama to bemoan the underfunding of mental health services in America. Court records describe erratic behavior and threats of violence that led to a brief involuntary hospitalization in 2008 and a restraining order preventing Houser from approaching family members. Houser "has a history of mental health issues, i.e., manic depression and/or bipolar disorder,'' his estranged wife told the judge. Educated in accounting and law, he owned bars in Georgia — including one where he flew a Nazi banner out front as an anti-government statement. He tried real estate in Phenix City. But Houser's own resume, posted online, says what he really loved to do was make provocative statements at local board meetings and in the media. On an NBC television affiliate's call-in show in the 1990s, Houser encouraged violent responses to abortion and condemned working women, host Calvin Floyd recalled. He was an "angry man" who spoke opposite a Democrat and really lit up the phones, he added. In recent years, Houser turned to right-wing extremist Internet message boards, where he praised Adolf Hitler and advised people not to underestimate "the power of the lone wolf," according to the Southern Poverty Law Center. Its hate-group watchdogs spotted Houser registering to meet with former Ku Klux Klan leader David Duke in 2005. What prompted Houser to kill people Thursday night remains unknown. He seemed like just another patron as he entered Lafayette's The Grand 16 theater, one of 25 people who bought tickets to the romantic comedy starring feminist jokester Amy Schumer as a boozing, promiscuous reporter. Police believe he hoped to escape his deadly ambush before police closed in. Houser had swapped the license plates on his 1995 Lincoln Continental before parking it by the theater's exit door. He had stashed the keys atop one of its wheels. Once inside, he sat by himself and gave others in the theater no reason for concern before he began shooting, firing first at two women who were sitting in front of him, then wounding nine other people. A crowd at a farmers market in Lafayette, La., pays respects July 25, 2015, for victims of a deadly shooting two days earlier at a movie theater in the city..
Mann said after hearing the first shot, she looked to her left and saw Houser fire at least four more times in a semicircle in front of him. The situation was so difficult to comprehend that Mann said she didn't scream. "After the first shot, you could hear people saying, 'What?' What was that?,' because I think everybody had this reaction,'' she said. "It was a strange. You go to the movies to escape from problems and escape from thoughts and due dates," she said. "You needed a second to think, 'OK, this is real, this is happening.' "
She dropped to the ground and scrambled to the exit on her hands and knees, leaving behind a shoe and her purse. 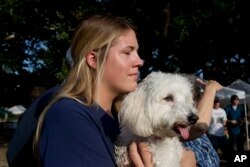 As she ran through the movie theater to the parking lot, she could hear people yelling that there was a shooter inside. Among the chaos, Jeanerette High School English teacher Ali Martin and librarian Jena Meaux were credited with helping save lives. Meaux, who was shot in the leg, told her colleagues that Martin, who was shot in the kneecap, still managed to pull a fire alarm, their former principal, Heath Hulin, said. The lights came on as the siren sounded, with a message urging everyone to leave. Outside, a woman was lying down, shot in her leg, said Jacob Broussard, who heard the gunshots from another theater across the hall. The two women killed were 21-year-old Mayci Breaux and 33-year-old Jillian Johnson. Breaux's body was taken to the same hospital where she was preparing to become a radiology technician. Johnson ran clothing and art boutiques, played in a roots rock band, and planted fruit trees for neighbors and the homeless. Heidi Guillory hugs her dog Cohen during a moment of silence for shooting victims in Lafayette, La., July 25, 2015. Across Lafayette, there's been an outpouring of love for the victims, with people leaving them flowers and business signs calling on people to remember them. 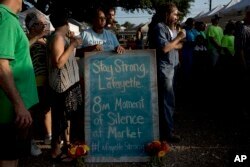 "Stay strong Lafayette,'' read a sign in front of a drugstore. "I will never know those women but I think there will always be a love for them,'' Mann said, a senior at Louisiana State University who wants to become a doctor. The wounded ranged in age from teenagers to their late 60s, Craft said. Five were treated at Lafayette General Health Center. Three patients had been stabilized, including one who remained in intensive care. Two others were released Thursday night. Russell County Sheriff Heath Taylor said his office denied Houser's request for a concealed-weapons permit in 2006 because he had been treated for mental illness and arrested for arson in Georgia. "He was pretty even-keeled until you disagreed with him or made him mad,'' said Jeff Hardin, the former mayor of Phenix City, just across the state line from Columbus. "Then he became your sworn enemy." Hardin said he once partnered with Houser on a real estate project, but they had a falling out and hadn't spoken since around 2007. Houser was evicted from his home in Phenix City last year, then returned to throw paint, pour concrete down the plumbing and tamper with a gas line, Taylor said. Houser's wife filed for divorce in March, saying their differences were irreconcilable and his whereabouts were unknown. His mother recently lent him $5,000, but “it just seems like he was kind of drifting along,'' Craft said. After detailing each victim's wounds, David Callecod, president of Lafayette General Health, pleaded Friday for society to provide as much funding for mental health services as it does for other medical problems. Pressed to explain why Houser wasn't arrested before, Taylor also blamed cuts in the safety net.